Salmon Berry Ski Hill Mile 5 Richardson Highway April 15, 2017 Find our event on Facebook. 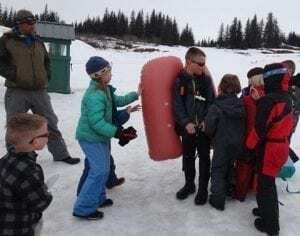 10am Bring the kids out to SalmonBerry Ski hill for a morning of Easter fun. Families will learn and practice wilderness skills such as avalanche rescue, fire starting, first aid for hypothermia and shelter building. 11:30am They will join in an Easter Egg Hunt. Golden ticket wins an Easter Basket. Meet the Easter Bunny! If you or your kids have avalanche rescue gear (beacon, probe, and shovel) bring it along to practice with. Encourage your kids to bring their ‘hiking’ backpack ready with what they carry for their outdoor adventures; we’ll share ideas and discuss gear appropriate for different activities. This event is sponsored by the Valdez Avalanche Center, the City of Valdez Parks & Rec, the Department of Public Safety, and the Alaska Avalanche Information Center.